Our New Synthetic Brushes Have Arrived! The perfect brush is the key to applying Buff'd Mineral Cosmetics - and we have them! Not all synthetic brushes are created equally. Each of our new brown faux brushes is specifically selected for use with mineral make up. These robust yet super gentle brushes pick up color well and deliver a soft and smooth application. Synthetic bristles are hypoallergenic and safe for sensitive skin. They clean and dry quickly and do not shed. These cruelty free and vegan approved brushes are extremely durable and provide for the softest application of Buff'd Mineral Cosmetics. We have added several new brush types including the Jumbo Buffer brush. 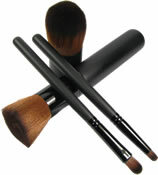 Like a long-handled Kabuki Buffer this fabulous brush provides for the perfect application of our Mineral Foundations. Two more new favorites are the Smudger - a small yet robust brush perfect for smudging those smoky eyes and the Multi-Task with an all-purpose eye shadow brush on one end paired with the perfect line brush on the other. 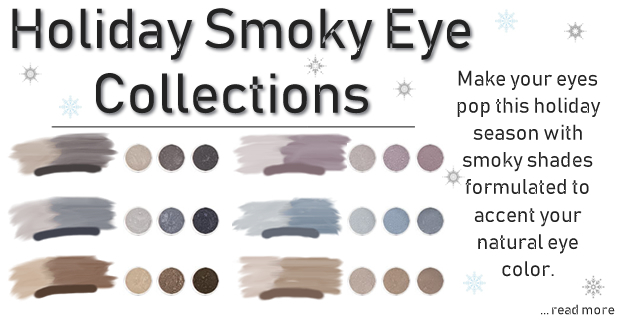 Make your eyes come alive this holiday season by creating smoky eyes using shades specifically formulated to make your natural eye color pop. The smoky eye is big this season and there is no better way to accent your natural eye color than to surround it in shades that are the opposite of your eyes. 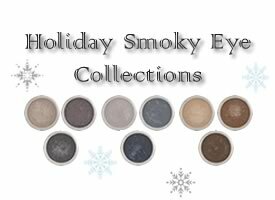 Buff'd has put together three fantastic eye shadow collections aimed at making your eyes stand out this holiday season: Smoky Plums for green eyes; Slate Blues for brown eyes; and Soft Browns for blue eyes. Just in time for the festive holiday season, Buff'd Cosmetics has whipped up some winter warmth in several new shades. In response to client requests we have added a new Custom Mix foundation option to our Mineral Foundations category. For those clients who find that their skin tone falls in between shades you may now request a custom mix of up to three colors. Simply add the custom mix to your cart and let us know which shades and what percentages of those shades you would like in the comments section when completing your order. And don't forget the formulations too! Example: 50% Cream Original, 25% Warm Light, 25% Chamois Original.